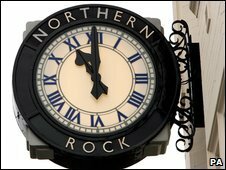 Northern Rock customers will be told in January if their mortgage is held in the "good bank" or "bad bank" section of the institution. The latest legal hurdle has been cleared that will allow the nationalised bank to split into two parts on 1 January 2010. The government loan to the Rock will increase by £8bn to support the move. Customers need not take any action but will receive a letter during January to say where their finances are managed. The split is aimed to pave the way for a partial sale. The plan was given EU approval in October and now the Treasury has put in place the legal mechanism through which the restructuring will happen. One business called Northern Rock plc, described as the "good bank", will hold all savings accounts - currently amounting to £19bn, carry out new lending and hold £10bn of existing mortgages. It will also hold certain wholesale deposits. Up until a couple of years ago Northern Rock's mortgage book was expanding rapidly and it was the UK's market leader in terms of new policies sold. But in September 2007 the BBC revealed that Northern Rock had been granted emergency financial support from the Bank of England, after falling foul of the crisis in global financial markets. The bank was formally nationalised in February 2008. The UK government's plan to split Northern Rock into a "good" bank and "bad" bank has now received EU approval, paving the way for a sale of its "good" assets to a third party. A second "bad bank", called Northern Rock (Asset Management) plc will hold the majority of the mortgage book - about £50bn - and repay outstanding government loans. The Rock estimated that more than 90% of these mortgage holders will not be in arrears on their repayments. While the "good bank" will be eventually sold to a third party, the "bad bank" will run down its remaining assets and will eventually be liquidated. The government will add £8bn to its existing loan to support Northern Rock's retail deposit book and new lending, the Rock said. Customers are being told that they need not do anything and the terms and conditions of their deals will not change. "We want this to be a seamless process for our customers and they do not need to take any action," said chief executive Gary Hoffman. "We will be writing to them in early January confirming which company holds their account - but we have already confirmed that all savings accounts will be in the new bank. "I am pleased with the progress to date, and all of the hard work colleagues are doing behind the scenes to ensure this is a smooth process for customers." People's savings will still have a 100% government guarantee after the split date, but this will be reviewed by the Treasury after the restructuring. At least three months notice must be given to customers following any decision to end the guarantee, and fixed term accounts will retain the guarantee for the term of the product. If any other regulated banks and building society goes bust, the first £50,000 of saver's funds are guaranteed.